The story so far: we imagine a huge box surrounding us, with sides hundreds of millions of light-years across. This cosmic box contains all the stuff of the whole universe in the same proportions; it grows as the universe expands, so its history traces that of the entire universe. We ended up able to talk about dark energy, dark matter, and how the balance of energy changed over time. The cosmic box is a very useful thing, despite being imaginary. I have glossed over a lot, though, and the next few “Universe in a Box” posts will pick up some of the spare pieces. 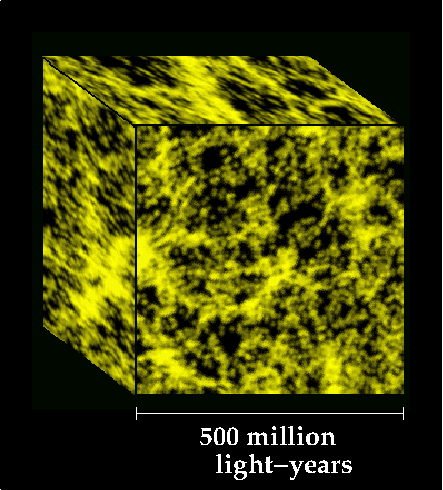 One interesting unanswered question is “How big is the universe?” Even though we’re focused on one (relatively) small cube, we know that isn’t the whole cosmos, so we must ask how many of these cubes are there? And, as always in science, we must ask how we can begin to answer that question. The size of the universe is actually a trickier question than it may seem at first. For one thing, nobody sane believes the universe we see encompasses everything: we would have to live in a very special place indeed if the universe is a sphere with us at the center, and based on observations that idea doesn’t hold up at all. Measuring expansion and extrapolating backwards, we find the universe is between 13.6 and 13.8 billion years old; because the speed of light is the fastest anything can travel (blah blah neutrinos blah), some things are far enough away that the light they emit hasn’t reached us—and may never reach us. Some of my students have expressed sorrow that so many galaxies are out there that we’ll never see, even if we manage to hold on as a species for billions of years. The question then splits into two pieces: how big is the whole universe (including the stuff we can’t see), and how big is the observable universe? So far, efforts to find the effects of a finite universe have been unsuccessful, but that doesn’t rule the possibility out completely: the curvature might just be too huge for us to measure. If that’s the case, it would be difficult or impossible to distinguish between this kind of universe and one that is actually infinite—no closure in any direction, just more and more space. That option seems fairly likely (to me at least), even though it may sound bothersome to you, since it would also contain an infinite amount of matter and energy. Result: the actual size of the whole universe is unknown, but it seems to be much larger than the observable universe, if not infinite in extent. Cosmic expansion animation, redux. Note that the expanding boxes represent the universe at a given moment in time, not how it appears to us. A moment’s thought gives a simple answer for the size of the observable universe: if it is between 13.6 and 13.8 billion years old, then the observable universe must be between 13.6 and 13.8 billion light-years in radius (or between 27.2 and 27.6 billion light-years in diameter). But here’s where I’ve been less than honest with you: the views of cosmic boxes as the universe expands (as shown on the right) represent the universe as it is at different moments in time, but that’s not what we see. Think about a galaxy emitting a pulse of light (a flare from its central black hole, for example): the light will travel across space until it reaches our telescopes, but the universe is expanding the whole time. That means we’re seeing where the galaxy was, not where it is now: it’s actually farther away. Also, since we are effectively looking into the past, we’re seeing a smaller cosmic box containing that distant galaxy than its box is now. The image below depicts the reality and the appearance superimposed. Reality vs. appearance for three galaxies. The white boxes enclose the galaxies as they actually are now: note that these boxes are of the same size, so they represent the same moment in time. 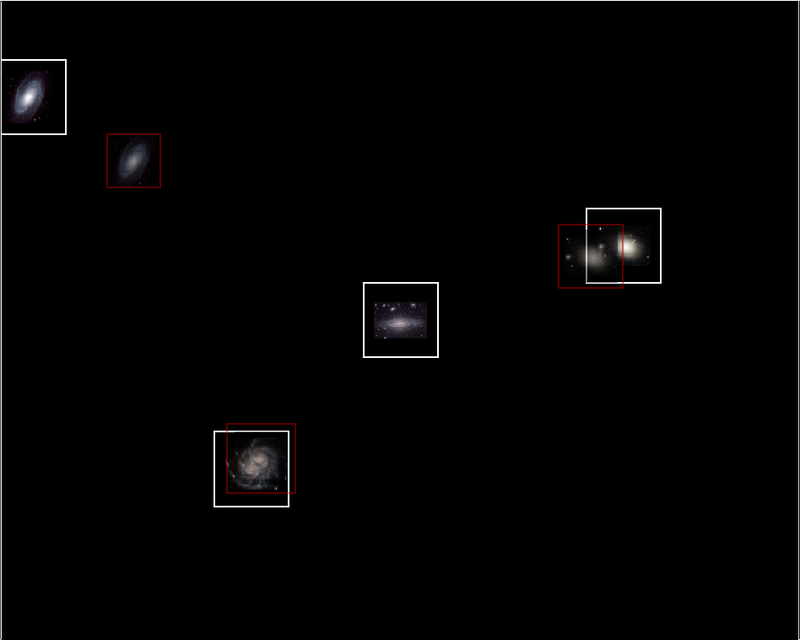 The red boxes enclose the same galaxies as they appear to us: the farther away a galaxy is, the longer light has taken to travel to us, so we are looking farther into the past. The nearest galaxy, on the other hand, hasn't moved much and the size of its apparent box is about the same as it is in reality. The farther away a galaxy is, the longer light has to travel to reach us, during which time the universe continues to expand, carrying the galaxy farther. Observing a galaxy from the early universe, the light has “only” been traveling 13 billion years, but the galaxy itself is a lot farther than 13 billion light-years away by now. Therefore, the observable universe is much larger than 13.8 billion light-years in radius: it’s more like 46 billion light-years! Result: the observable universe is approximately 46 billion light-years in radius, not because the light took 46 billion years to reach us but because the universe continues to expand even as the light travels across space to us. Just a note to give this series big love. I haven’t read any cosmology for maybe 30 years. The texture and pace and asides and tangent links are just perfect for me. You are really demonstrating your gifts here.